Founded in 1906 in Spelle (Germany) Krone remains a family owned company. 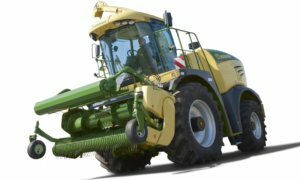 Their continuing vision is to provide innovative and performance engineered machinery for the forage and hay industry. Krone make listening to their customer’s one of the key driving forces for their business model. As a result of this they invest heavily in research and development. 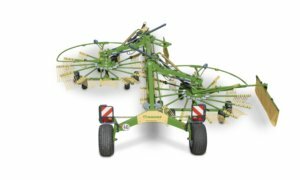 BRM are proud to be official UK dealers for Krone. Krone UK are only involved in the hay and silage market. Therefore all their expertise and design skills are focused entirely on making grassland production more profitable and efficient. 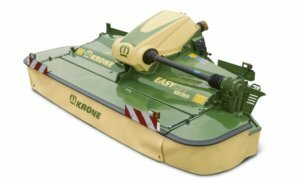 Krone offer a full range of hay and forage equipment including mowers, tedders, rakes, foragers, forage waggons, balers and wrappers. At the heart of a high quality forage is a clean cut. The tried and tested EasyCut cutter bar from Krone will deliver just that. In fact we can offer a full range of mowers, from a 2m cut with AM disc mowers, to 9.3m with the EC triple mowers. While the award winning Big M stands out in front, as the leading high capacity mower on the market. ell worth a look. Working widths of up to 19.6m offers a choice to suit all requirements. Swadro rakes have some exciting features available. In particular maintenance free rotors and tine arms, liquid grease bevel gearbox’s and DuraMax camtracks will all reduce time spent on maintenance. Available up to 6 rotors, these rakes can work to 19m. 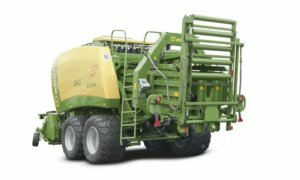 Krone round balers offer a wide range of choices to suit many requirements. They manufacture fixed and variable chamber balers which will of course produce excellent quality bales. The Bel lima, Fortima Comprima models all give impressive density and shape, no matter what crop you are baling. Indeed, the Krone Ultima is the world’s first machine to offer non-stop baling and wrapping. Need a large square baler that produces high density, rock hard bales quickly? Then you need a Krone BiG Pack! Internationally recognised innovations, a long history of baler design and a high quality manufacturing process. In fact these are some of the qualities that really set the BiG Pack apart. Setting trends in forager performance, the BiG X is currently, the worlds most powerful farming machine! A spacious comfortable cab coupled with excellent all round visability reduces operato r fatigue. The BiG X packs a serious punch and is crammed full of innovation. For example, the award winning VariStrean crop flow system. A MaxFlow chopping drum has its blades attached underneath for more carrying space and reduced wear. In addition the variable StreamControl gives accurate filling and improves fuel economy. Of course with power options from 490hp all the way up to 1110hp there is a Krone BiG X to suit all your forage options.